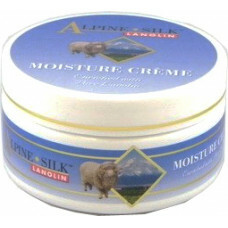 Alpine Silk lanolin moisture creme is a silky moisturizing crème that softens and protects your hands and body. Lanolin is easily absorbed into the skin and it creates a natural barrier that protects skin. Water, Mineral Oil, Glycerin, Glyceryl Stearate, Acetylated Lanolin Alcohols, Lanolin, Cetyl Alcohol, Isopropyl Myristate, Polysorbate 60, PEG-100 Stearate, Phenoxyethanol, Tocopheryl Acetate (Vitamin E), Methyl Paraben and Propyl Paraben and Ethyl Paraben and Butyl Paraben, Fragrance.